You might recognize this handsome boy …his name is Mojito or Mojo for short. 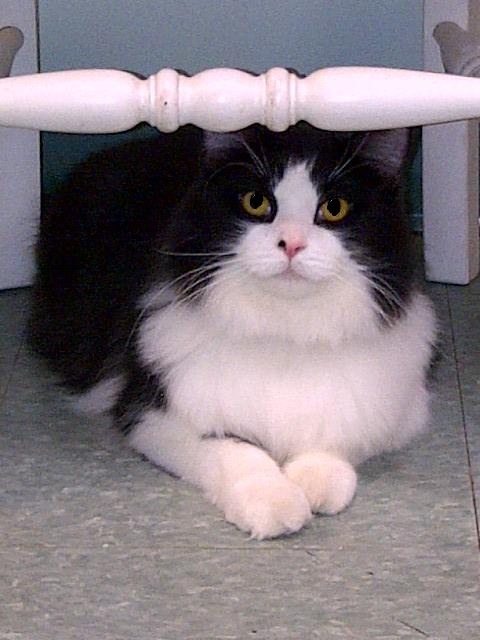 Mojito has been the clinic cat at our sister clinic in Ancaster. He’s becoming bored and has decided he would much rather have a family of his own. 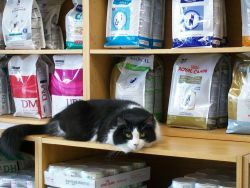 Due to of his medical history he will need to be on a special diet for the rest of his life; but don’t let that scare you. Urinary diets are about the same cost as other top quality diets. Mojito was originally rescued by one of our team members. Deborah was called by a friend of hers when he was left behind in an apartment building after the tenants skipped out 5 days earlier. When the apartment building’s owner found him he was anemic because he had so many flea’s, badly matted, and he was urinating blood! Deborah of course couldn’t leave him like this so even in the middle of a thunderstorm she couldn’t help but go and rescue this scared little man. It’s been a year and a half and he’s now healthy and really looking forward to having a family of his own. His matts are all gone and as long as he’s on his special food he has had no further problems with his bladder. After having Mojito back in our clinic for a few days Debra decided she just couldn't bare to part with this handsome boy a second time. He's now an official member of her forever family. If you’re interested in Mojito please email the clinic at reception@thecatclinic.ca or you can call us at 905-387-4151 for an application.